Global magnetic fields are observed on some terrestrial planets (Earth and Mercury), on all of our giant planets and on the sun. Differential rotation is observed on the surfaces of our giant planets (the banded zonal winds) and the sun (the equatorial acceleration) and is inferred via helioseismology in the solar interior. The most dramatic displays of differential rotation exit on the surfaces of Jupiter and Saturn, where the zonal winds have banded patterns in latitude of eastward and westward flows relative to the mean rotation rate. We study these problems simulating them on computers using two-dimensional (2D) and three-dimensional (3D) numerical models we have developed. Our models solve a coupled nonlinear system of equations that describes conservation of mass, momentum and energy and the induction of magnetic field. The solution is the time-dependent fluid velocity, magnetic field, density, pressure, specific entropy, light constituent mass fraction and gravitational potential, all within the modeled rotating fluid sphere. One 3D model uses a spectral solution method (Glatzmaier, 1984; Glatzmaier and Roberts, 1995), i.e., the variables are expanded in spherical harmonics to represent their horizontal structures and in Chebyshev polynomials to describe their radial structures. This method is very accurate; the challenge is to make the required global communication efficient on massively parallel computers. A spectral transform method, using fast Fourier transforms, is used to compute the nonlinear terms. The solution is evolved in time, treating the linear terms implicitly and the nonlinear terms explicitly. This model has been validated by simulating a rotating convection experiment we flew on a NASA space shuttle (Hart, Glatzmaier, Toomre, 1986) and later by benchmarking it with other dynamo models (Christensen et al., 2001). Another 3D model employs a finite volume method with an implicit time integration (Evonuk and Glatzmaier, 2007b). The spectral model is more accurate than this finite-volume model (for a given number of mesh points or modes); however finite-volume model is more efficient since it requires only nearest neighbor communication on parallel computers. The finite volume method also allows us to more easily simulate convection or gravity waves through the center of the spherical fluid body. These two 3D models have corresponding 2D versions (Glatzmaier et al., 2009; Rogers and Glatzmaier, 2005a,b, 2006; Rogers et al., 2003, 2006, 2008; Evonuk and Glatzmaier, 2004, 2006, 2007a). These are used to test much more turbulent simulations, which require much finer spatial resolution. Our 2D planetary simulations clearly demonstrate that strong differential rotation is established due to the generation of vorticity resulting from the expansion of rising fluid and contraction of sinking fluid, which other (incompressible) models completely neglect. We show that the presence of a small solid core results in significantly different flow structure relative to that of a fully convective interior only if there is little or no planetary rotation. The zonal winds that are maintained in these turbulent simulations have greater surface amplitudes for cases with smaller solid cores and therefore larger buoyancy driving, all other properties being equal. The superposition of the convective flow and the stronger zonal flow produces wave like instead of cellular convection. The snapshot illustrated in Figure 1a shows small-scale turbulent convection in the equatorial plane together with a large-scale spiral flow pattern. This pattern is continually being sheared by a rotation rate that varies with radius, i.e., the differential rotation, which is maintained by the nonlinear convergence of angular momentum. These simulations also demonstrate that turbulent convection produces very different patterns of large-scale flow and differential rotation compared with those produced by laminar convection. This means that there is a real need for higher spatial resolution - not just to see the small scale details better - but to be able to simulate much more realistic flows, differential rotation and magnetic fields in planetary and stellar interiors. Our simulations of the interior of the sun are the first to include both the outer convection zone and the deep inner, stable, radiative region. They are the first to produce a rich spectrum of gravity waves in the deep interior excited naturally by the turbulent thermal convection above. We produce power spectra for gravity waves in the radiative region as well as estimates for the energy flux of gravity waves below the convection zone. The simulations show that the linear dispersion relation is a good approximation only deep below the convective-radiative boundary. Both low-frequency propagating gravity waves and higher frequency standing modes are generated although we find that convection does not continually drive the standing g-mode frequencies. We also find that angular velocity variations in the tachocline are driven by angular momentum transported by overshooting convective plumes rather than nonlinear interaction of low amplitude waves. The result is a short period aperiodic oscillation in amplitude (but not the direction) of the mean flow in this overshoot region just below the convection zone. Low amplitude gravity waves, continually excited by the overshooting plumes, do propagate throughout the deep radiative interior and deposit their angular momentum. The different damping experienced by prograde and retrograde waves produces a very small amplitude, radially banded differential rotation in the radiative region. Figure 1b shows a snapshot from one of these simulations. Fig. 1 (Left) A snapshot of the thermal pattern of convection in the equatorial plane of a simulation a giant planet. (Right) A snapshot of the thermal pattern in the equatorial plane of a simulation of the sun. We have also produced the first dynamically-consistent 3D computer simulations of turbulent convection and magnetic field generation in a giant planet accounting for density stratification. The resulting surface zonal winds are very similar to those observed on Saturn (Figure 2) and the resulting magnetic field is a dominant axial dipole above the surface (Figure 2) as it is on Saturn. The spatial resolution is 241 levels in radius, 768 in longitude and 768 in latitude. Although this simulation was run for over three million numerical time steps, representing approximately six years, the zonal wind bands are still slowly developing at high latitude and the magnetic field has not fully evolved in the deep interior. We also would like to increase the spatial resolution in order to reduce the viscosity and obtain more turbulent convection, i.e., an even more realistic simulation. Fig. 2 (Left) Simulated zonal winds (differential rotation) compared to that measured on Saturn's surface. 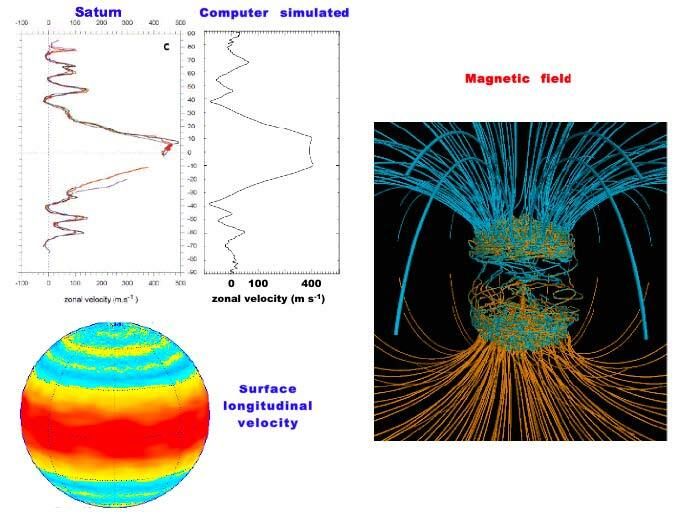 (Right) Simulated magnetic field in a model of Saturn illustrated with magnetic lines of force. Yellow lines represent outward directed field and blue lines represent inward directed field. Figure 3 shows some results from our other 3D model (finite-volume) for a fully-convecting interior (i.e., no solid core) as may be the case for Jupiter. The thermal and flow structures have a spiral pattern within the equatorial plane. At the surface the zonal wind is a strong prograde jet in the equatorial region with weaker alternating jets at higher latitudes. Fig. 3 (Left) A snapshot of the vorticity in and normal to the equatorial plane (viewed from the northern hemisphere) produced with the 3D finite-volume model. Reds and yellows are cyclonic; blues are anti-cyclonic. (Right) The surface zonal wind profile. Christensen, U.R., Aubert, J., Cardin, P., Dormy, E., Gibbons, S. et al., "A numerical dynamo benchmark," Phys. Earth Planet. Inter. 128, 25-34 (2001). Glatzmaier, G.A.,"Numerical simulations of stellar convective dynamos. I The model and method," J. Comp. Phys., 55, 461-484 (1984). Glatzmaier, G.A. and Roberts, P.H.,"A three-dimensional self-consistent computer simulation of a geomagnetic field reversal," 377, 203-209 (1995). Glatzmaier, G.A., Evonuk, M.A. and Rogers, T.M., "Differential rotation in giant planets maintained by density-stratified turbulent convection," Geophys. Astrophys. Fluid Dynam., 103, 31-51 (2009). Evonuk, M.A. and Glatzmaier, G.A. 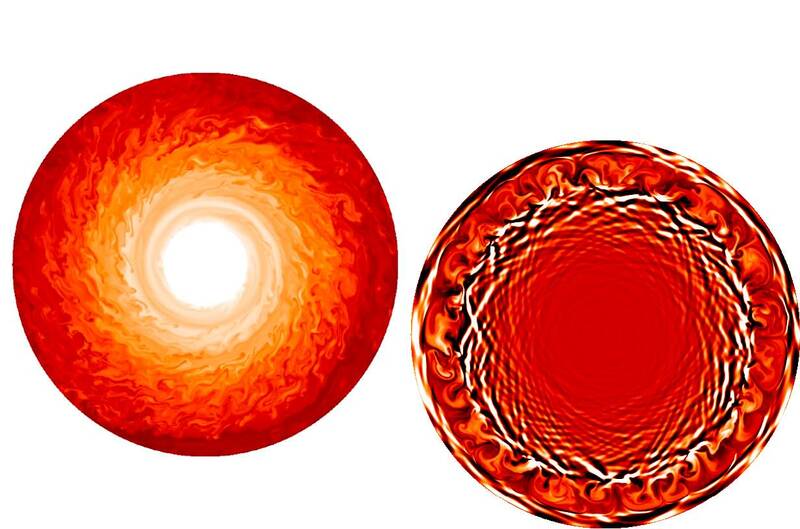 "2D studies of various approximations used for modeling convection in giant planets" Geophys. Astrophys. Fluid Dyn., 98, 241-255 (2004). Evonuk, M.A. and Glatzmaier, G.A. "A 2D study of the effects of the size of a solid core on the equatorial flow in giant planets" ICARUS, 181, 458-464 (2006). Evonuk, M.A. and Glatzmaier, G.A., "The effects of small solid cores on deep convection in giant planets," Planet. Space Sci., 55, 407-412 (2007a). Hart, J.E., Glatzmaier, G.A. and Toomre, J., "Space-laboratory and numerical simulations of thermal convection in a rotating hemispherical shell with radial gravity,"J. Fluid Mech. 173, 519-544 (1986). Rogers, T.M. and Glatzmaier, G.A., "Penetrative convection within the anelastic approximation," Astrophys. J. 620, 432-441 (2005a). Rogers, T.M. and Glatzmaier, G.A., "Gravity waves in the sun," Mon. Not. R. Astron. Soc. 364, 1135-1146 (2005b). Rogers, T.M. and Glatzmaier, G.A., "Angular momentum transport by gravity waves in the solar interior," Astrophys. J., 653, 757-765 (2006). Rogers, T.M., Glatzmaier, G.A. and Jones, C.A., "Numerical simulations of penetration and overshoot in the sun," Astrophys. J., 653, 766-773 (2006). Rogers, T.M., Glatzmaier, G.A. and Woosley, S.E., "Simulations of two-dimensional turbulent convection in a density-stratified fluid," Phys. Rev. E. 67, 026315-1-6 (2003). Rogers, T.M., MacGregor, K.B. and Glatzmaier, G.A., "Nonlinear dynamics of gravity wave driven flows in the solar radiative interior," Mon. Not. R. Astron. Soc., 387, 616-630 (2008).